A sequel to the comedy film Coming to America is reportedly in the works. 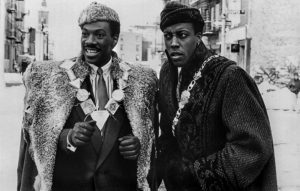 The 1988 film – which starred Eddie Murphy as the crown prince of the fictional African country Zamunda, who attempts to find a woman in the US who he can marry – was a huge box office success upon its release (generating $288 million worldwide), and was nominated for two Academy Awards (Best Costume Design and Best Make-up) the following year. 29 years on from the release of the original film, a sequel to Coming to America is now reportedly in the very early stages of pre-production. The Hollywood Reporter reports that Paramount are behind the new film (as they were in 1988), having recruited the original writers David Sheffield and Barry W. Blaustein to work on the new project. However, the film’s star Murphy has yet to commit to the sequel – though it is hoped that the notion of working with Sheffield and Blaustein, who together go all the way back to the comedian’s time on Saturday Night Live in the early 1980s, could persuade the comedian to sign on to the project. Earlier this week, Murphy paid tribute to his brother Charlie following the sad news of the latter’s death. The post A ‘Coming To America’ sequel is in the works appeared first on NME.